Meteorite Hunter Scours The Ground For Bits Of Sky Every so often, pieces of heaven crash into Earth, and Ruben Garcia is looking for them. Aboard his trusty Jeep, the meteorite hunter rides the Arizona landscape, searching for space rocks with a magnetic golf club. One of Ruben Garcia's favorite spots to go meteorite hunting is an enormous dry lake bed in southern Arizona. Every so often, pieces of heaven crash into Earth. They can come from our own solar system, or millions of light years away. Few of us are lucky enough to get our hands on one of these space rocks. But for meteorite hunters and dealers such as Ruben Garcia, touching a piece of outer space is a daily routine. One of Garcia's favorite spots to go meteorite hunting is an enormous dry lake bed in southern Arizona. 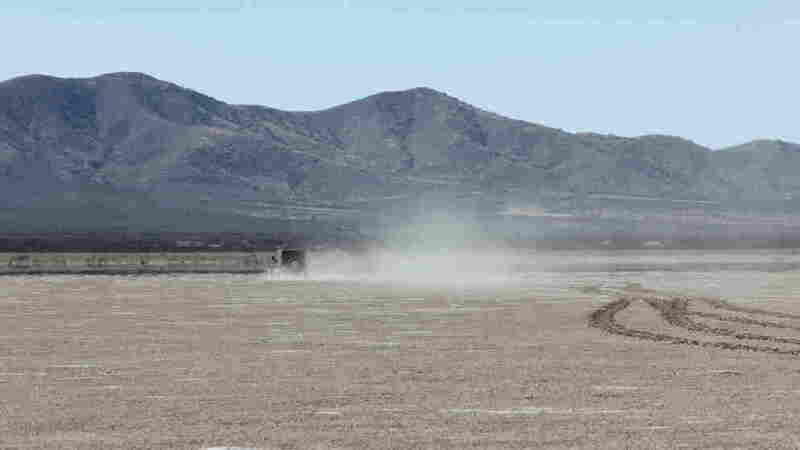 "It's been a dry lake bed for tens of thousands of years, and the reason that's good for us is because on average, a meteorite strikes the Earth about one per thousand years per square mile," Garcia says. "The longer this dry lake bed has been here, exactly like this, the longer it's had time to accumulate meteorites." 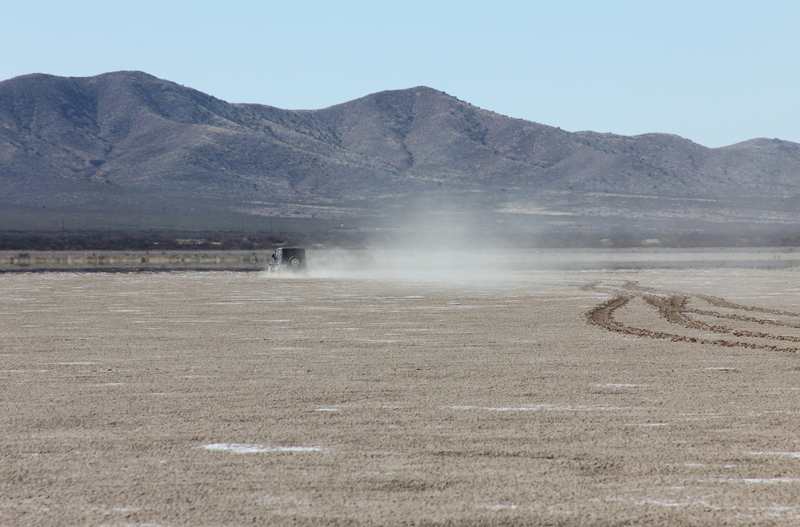 The lake bed is a lunar landscape — about 50 square miles of flat dusty, cracked earth. In the distance, it looks like there's water, but it's only a mirage. Garcia starts to drive in small circles, leaving tracks in the dirt with his tires. He explains that sometimes, when you are out on a giant, dry lake bed, the best way to hunt meteorites is from the seat of your Jeep. It's not just the air conditioning; it's that you can cover more ground and spot the dark rocks from a distance. When Garcia sees something that catches his eye, he pulls his Jeep over and picks the object up. "The problem with this one is I can see right away it has quartz in it," he explains. "Meteorites don't sparkle. People assume sometimes from reading in websites that they're shiny and they sparkle, but they never do." At the edge of the lake bed — a good place to find rocks — Garcia hops out with a long golf club that has a magnet glued to the bottom. Meteorites have a large percentage of nickel iron, he says, and the nickel iron will stick to a magnet. Regular rocks often stick to magnets, too. "A lot of people think that we use a magnet to definitively I.D. a meteorite, but nothing could be further from the truth," Garcia says. "A large majority of volcanic rocks will stick to a strong magnet, so we don't use a magnet to I.D. a meteorite at all, in fact, we only use it to pick it up, and then we'll decide if it is man-made, or terrestrial, or extra-terrestrial." A rare mesosiderite meteorite found by Ruben Garcia. So how can you tell the trash from the treasure? You examine it with a strong magnifying glass called a loupe. Garcia says you look for physical signs the object has come through the atmosphere. This is tough work. For more than 20 years, Garcia has traveled to places in the middle of nowhere and studied flecks, specks and spots in thousands of rocks — all to find meteorites that are often the size of walnuts, and sometimes worth the same. "Most meteorites are not very valuable at all," he says. "If we find a met out here today, and it's the size of a golf ball, and we really got aggressive marketing it, we might be able to buy lunch for all of us." Fast food, of course, not an eight-course meal. "You can literally buy meteorites on eBay for 15 or 20 cents a gram," Garcia says. It's not all walnuts, though; sometimes there's a diamond. Every now and again something so special will fall from the sky that everyone wants a piece of it. That's what happened last July when 15 pounds of rock fell to Earth from Mars. Caroline Smith, a curator from the Natural History Museum in London, got the biggest piece of martian meteorite, named Tissint. "This meteorite is absolutely brilliant. It's almost as if it was knocked off Mars yesterday, it's so fresh," she says. "It is so pristine, it is arguably the most important meteorite to have landed in the last 100 years." 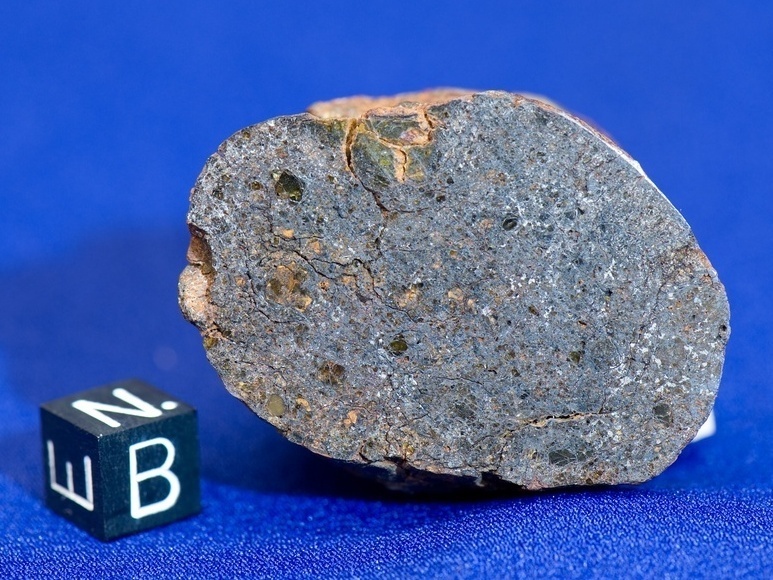 Smith refused to say how much the museum paid for the 1.1-kg hunk, but it was a pretty penny; other pieces of the meteorite sell for as much as $1,000 a gram. "There is so much interest in Mars as a possible place in the solar system where life may have existed in the past — you know, 'Are we alone?'" Smith says. "So even though the diamond may look nicer, the fact that you're holding something from Mars and so rare and so precious and so interesting — beats diamond every time." 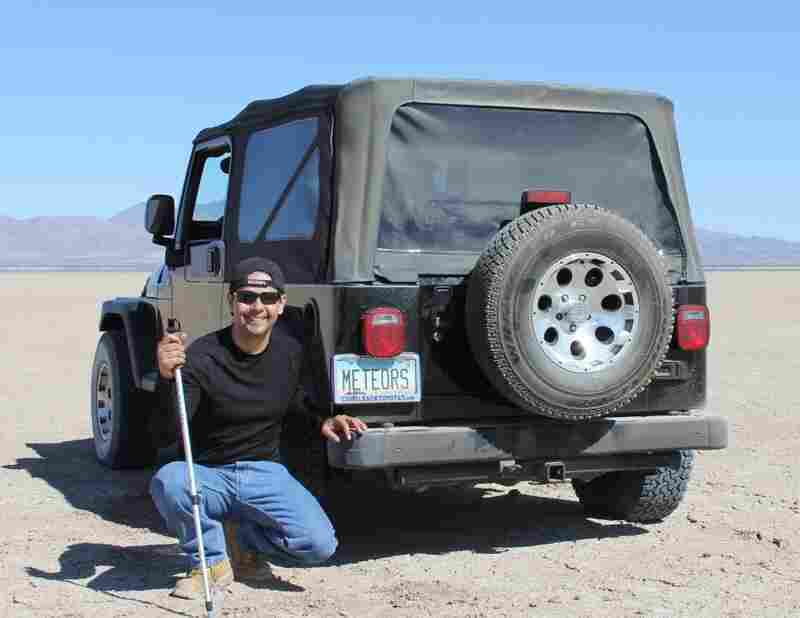 Meteorite hunter Ruben Garcia and his Jeep. It's not uncommon for Garcia to spend days in the sun, poking at rocks with golf clubs, only to go home empty-handed. "Meteorite hunting is just that: You're out there, looking for something that you don't even know if it exists," he says. "A lot of times, you'll have all the right information, it looks like they should be there, and they're just not." But this is what makes meteorite hunters feel connected to something bigger, something other-worldly. "We offer up specimens that science would have never found without meteorite hunters. Scientists are not meteorite hunters, they're scientists," he says. "When meteorite hunters find specimens for science to study, in a very direct way, I like to think that we play a big part in the space race. You know we give them extra-terrestrial material to study, where without met hunters we would need a ship and a whole bunch of fuel to retrieve it." Whether it's to study, display, or just hold for a little while, who wouldn't want their very own piece of the stars?